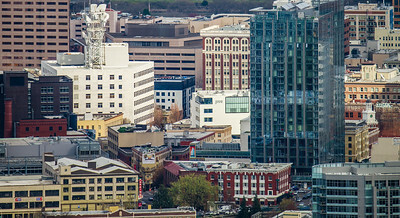 As a suburbanite living on the Portland urban growth boundary where rolling hills and farmlands fill the view to the south, I feel claustrophobic when driving in downtown Portland. This 400 mm photograph from the Pittock Mansion high in the West Hills of Portland on a gray March afternoon provokes the crowded claustrophobic sensations that I feel driving in the city. For reference, the Zeus Cafe marks the Y-intersection of Burnside and Stark. It's just below the red and white parking sign along the bottom center left. Washington Street is coming in on the bottom center right. Best seen from the Pittock Mansion. 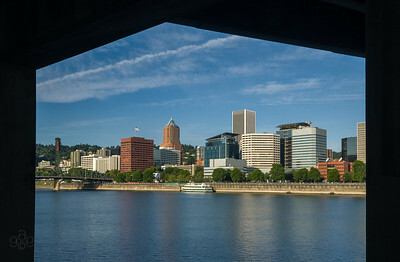 Viewed from the Vera Katz Eastbank Esplanade on a glorious September Saturday morning, the pillars of the Morrison Bridge frame the Portland skyline on the west bank of the Willamette River. The orange tower with the tourquoise roof is the Koin Building. The Portland Spirit cruise ship is docked in front of the Salmon Street Springs Fountain. The bridge on the far left is the Hawthorne, an older sister to the Steel Bridge. The Waterfront Bike Trail runs through Tom McCall Park next to the seawall. A walker strides down the Waterfront Bike Trail in beautiful September morning light. The steam powered, sternwheeled tugboat, Portland, awaits the first Maritime Museum visitors. A fisherman races two sculling along the Willamette River. The Morrison Bridge crosees in front of the green spires of the Oregon Convention Center. The Pittock Mansion lies high above Portland, Oregon in the West Hills. Originally owned by Henry and Georgianna Pittock, the mansion is a museum today. Henry Pittock was the owner and publisher of the Oregonian which he converted from a weekly to a daily newspaper. This mansion perch allowed him to overlook many of his rail, real estate, banking and transportation operations. This handheld panorama is a 14 vertical-shot stich at 165mm. The aspect ratio is 5.5:1. A 30 inch long print would be only 5.4 inches high.